The 2007 British Grand Prix was the ninth race of the 2007 Formula One season. It was held on 8 July 2007 at the Silverstone Circuit. The race was won by Kimi Räikkönen after overtaking pole position driver Lewis Hamilton during the first round of pit stops. Second place was taken by Fernando Alonso and Hamilton was third. Following British driver Lewis Hamilton's win at the 2007 Canadian Grand Prix, circuit director Richard Phillips reported that ticket sales had "gone through the roof". Phillips added, "we haven't seen this level of interest since Mansell-mania in the late 80s and early 90s". In the run up to the race Ferrari presented a legal case against English engineer Nigel Stepney and a McLaren employee, after a search warrant revealed evidence of theft of technical information from the Italian team. McLaren indicated that they would fully cooperate with the investigation, and after a thorough internal investigation the team concluded that "no Ferrari intellectual property has been passed to any other members of the team or incorporated into its cars." The FIA are launching their own investigation into the matter, but stress that their investigation will only involve matters of the Formula One rules and regulations. In another element of the pre-race activities, the Red Bull cars of David Coulthard and Mark Webber sported a livery of fan-submitted images as part of a one-off event for the charity Wings for Life. More than 30,000 fans pledged money and uploaded images to the team's website, and each fan has selected a spot on either car to have their image placed. The goal was to raise €1 million. This would be repeated again at the 2012 British Grand Prix, but the number would be reduced to 25,000 fans. Jarno Trulli set the fastest time of the second test day in his Toyota TF107. Preparations for the race began on 19 June, when the teams began testing at Silverstone. During the first day's testing Ralf Schumacher set the fastest time, focusing on his race setup for the Grand Prix. In contrast the two top constructors, McLaren and Ferrari, set about testing new parts and developments on their cars. This testing was undertaken by their respective test drivers, Pedro de la Rosa and Luca Badoer. Spyker brought a new chassis to the test and raced it for the first time, with Adrián Vallés and Giedo van der Garde taking the car around the track for 64 laps. Nick Heidfeld ended his test session early after complaining of back problems. In day two of testing it was Jarno Trulli's turn to take the Toyota car around Silverstone, and managed to set the fastest time before the session was slowed down by showers. While Ferrari continued to test new parts to their car, this time with Kimi Räikkönen taking to the seat, McLaren stuck with Pedro de la Rosa and worked on the race set up and aerodynamics. Day three saw Toyota drop down from taking the fastest times to take the fifth fastest time on a moderately damp track. Felipe Massa was the fastest man on the track after 87 laps of the British circuit testing various aerodynamic and mechanical adjustments to the car. Although delayed through an oil system problem Alonso finished off aerodynamics work and continued to set up the car for the coming British Grand Prix, finishing with a time slower than second placed Williams driver Nico Rosberg. The leading GP2 driver Timo Glock took to the circuit with BMW Sauber up against ex-rival Nelson Piquet Jr. who was driving with Renault. Piquet Jr. made the fourth fastest time, more than a second faster than Glock. The first Friday practice was dominated as per many of the previous Grand Prix of the season, with Ferrari and McLaren taking the top 4 times. Lewis Hamilton took the top time at his home Grand Prix, and the two Ferraris split Alonso from his team mate. Both McLaren drivers spun their cars at different parts of the test, and they were not the only to do so. Other such drivers included Robert Kubica, David Coulthard, Adrian Sutil, Trulli and Massa; who all spun their vehicles on the greasy, but dry track. In the end Rosberg managed to set a faster time than the two competitive BMWs, and Trulli - who boasted a fastest time at Silverstone during testing in the last month - only just managed to set a faster time than Anthony Davidson in the Super Aguri. Davidson outpaced his British counterpart Jenson Button in the works Honda by half a second. Button, who suffered a minor back injury in a shunt in the United States Grand Prix, decided not to partake in the second Friday practice session in order to avoid aggravating the injury. Toyota returned to previous testing form in the second session, putting their drivers in with the McLaren drivers, both of them outpacing Alonso. Schumacher even managed to run exactly the same time as Hamilton. Ferrari meanwhile got the two fastest times of the session, with Räikkönen a full half a second faster than his Brazilian team-mate. Williams were close up behind Alonso, as BMW were running lower in the field than usual. Although Kubica was not complaining, Nick Heidfeld said that "[the car] was difficult to drive, so we have to figure out why." Christian Klien got a drive during the practice to replace Button in the car and help set it up. Both of the works Hondas were beaten by both of the Super Aguri cars and Davidson improved on his time and position to tenth. Drivers from many different teams were running off the Copse corner, with eight drivers running off eleven times. The only incident of the afternoon was at the Copse, where Adrian Sutil ran his car onto the tarmac, then spun into the tyre barrier. He was unharmed and the damage to the car was insignificant. On the Saturday practice before the qualifying, the top drivers broke the 1 minute 20 barrier, with Massa, Alonso and Räikkönen all setting fastest laps in the high 1 minute 19s. Räikkönen took the fastest time, faster than rival Alonso who had set a very similar time to Massa. Hamilton's final time on low fuel was disrupted by Alexander Wurz sending his Williams off the track, resulting in a yellow flag. Toyota and Williams were the closest to the top of the pack - as BMW continued their bad run. Nick Heidfeld improved from his bad run from the day before to take a joint eighth fastest time, but team-mate Kubica found himself only able to achieve a sixteenth fastest time. Davidson out paced his team-mate for the third time of the weekend, and he achieved a tenth fastest time - something he has never converted to a qualifying session. The first qualifying session was disrupted near the end by Anthony Davidson, who spun his Super Aguri while attempting to warm the tyres, bringing out the yellow flags. This also meant that he could not complete a good hot lap and left him near the back of the grid. This also forced Sato and Button to slow down on their hot laps, and the three drivers could not improve on their previous times in the closing stages of the session. The six drivers eliminated in the first round were Albers, Sato, Sutil, Davidson, Button and Rosberg (for the first time this season, but due to an engine issue). The fastest time of the session was taking by Alonso. The second session was quite uneventful, with Alonso taking the fastest time again. Near the end of the session the six fastest drivers decided not to set any more times. This was a gamble for the two BMW drivers, as by the end of the session Heidfeld had been pushed down to tenth position. The six drivers who were eliminated from the final session were Liuzzi, Speed, Barrichello, Wurz, Coulthard and Webber. The two McLaren drivers were the first two drivers out on the track for the initial fuel burning phase, and initially, Alonso was the fastest on the track. After the first set of pit stops it looked like Alonso was going to take the pole. On the last set of laps, Alonso was on a faster time than he was before, but Räikkönen was on a faster. Both of them completed their laps and Räikkönen came out on top, despite an error coming out of the final corner. Hamilton who had been sitting in fourth did not look like he was very competitive during qualifying. In the last few seconds of the session he set the fastest lap and put himself on pole position, and he was the only one to break into the 1 minute 19 second margin. Hamilton leads the early stages of the Grand Prix, ahead of winner Kimi Räikkönen. Räikkönen got past Hamilton at the first round of pit stops and Alonso during the second to take his third win of the season. Alonso led the race during his middle stint, but had to settle for second place. After starting from pole position, Hamilton led until his first stop. He lost ground to Räikkönen and Alonso from that moment onwards, and finished third. Podium: First Räikkönen, second Alonso and third Hamilton. Felipe Massa stalled on the grid, leading to a second formation lap and causing the Brazilian to start from the pit lane, joining Takuma Sato, who also started from the pits. Hamilton led from the start with Räikkönen closely following and Alonso a few seconds behind them. Hamilton led the race until lap sixteen, when he made his stop and rejoined in fifth; his car briefly lurched forward with the fuel hose attached when Hamilton reacted to the 'lollipop' board being turned over. Räikkönen stopped three laps later and came out of the pit in front of Hamilton to take the race lead. Another three laps later Alonso took a good pit stop and came out in front of both of the previous race leaders. As Alonso was short-fuelled in the first set of pit stops in order to jump into the race lead, it meant that he had to stop quite early compared to his rival. McLaren's plan was to use the superior pace of a lighter car to build up a large gap between him and Räikkönen before the second set of pit stops, but the traffic played into Räikkönen's hands and when Alonso had to pit Räikkönen resumed the race lead. He was able to make his final stop and rejoined without losing first position. Behind the leaders, Massa was forcing his way through the pack to make up as many places as possible from the back, and finished in fifth behind a defensive Robert Kubica. Nick Heidfeld took sixth, while Heikki Kovalainen and Giancarlo Fisichella brought the two Renaults home in seventh and eighth. Rubens Barrichello and Jenson Button were taking advantage of being quite far back by investing in a one stop strategy and they finished ninth and tenth respectively. Nico Rosberg had a good race taking back quite a few places from the start - with points a possibility, but after a bad first pit stop he had to fight back to gain twelfth. His team-mate, Wurz, finished one place behind him in thirteenth after having tried to overtake Scott Speed and putting the American out of the race with broken suspension. David Coulthard took a good eleventh position; his team-mate, Webber, retired due to a full hydraulics failure. Adrian Sutil retired after a large engine failure going towards the Stowe corner. Toyota suffered the worst problems as both of their cars went out of the race, Ralf Schumacher retiring with a wheel fixation problem, and his team mate, Trulli retiring with handling problems. Anthony Davidson, after a good weekend of practice and an unlucky qualifying session, had to retire his Super Aguri car when he felt vibrations from the underside of the car. Liuzzi retired his car with gearbox failure but was ultimately still classified in 16th place. Räikkönen continued from the second stint of pit stops to take the win a couple of seconds ahead of Alonso. It was Räikkönen's second straight win after being victorious at the French Grand Prix the week before. Alonso, finishing second, told the Spanish press that he was adamant that he would catch up with Hamilton in the drivers championship saying that, "With normal races, sooner or later I will close the gap. I must always be one step higher than him on the podium." The British driver finished third to lose two points in the championship to the chasing Alonso, but also achieving his ninth podium out of nine race starts, equalling Jim Clark's record. Following the race Ferrari chief Luca di Montezemolo complained that although Räikkönen had now won more races than any other driver in 2007, he was not leading the championship. Di Montezemolo said: "This is unsporting, it’s wrong: F1 shouldn’t be a sport for calculators, it should be for winners." ^1 – Felipe Massa started from pitlane after he stalled on the grid prior to the first formation lap. ^2 – Started from pitlane. ^ Formula 1 Santander British Grand Prix Official Program. 2007. Retrieved 11 September 2010. ^ "British Grand Prix". Formula1.com. Archived from the original on 1 July 2007. Retrieved 4 July 2007. ^ a b c "Race result". Formula1.com. 8 July 2007. Archived from the original on 12 July 2007. Retrieved 8 July 2007. ^ "Hamilton win triggers ticket rush". Autosport.com. 12 June 2007. Archived from the original on 14 June 2007. Retrieved 12 June 2007. ^ "Ferrari name Stepney and McLaren engineer in theft allegations". Formula1.com. 4 July 2007. Archived from the original on 7 July 2007. Retrieved 4 July 2007. ^ "McLaren: no Ferrari elements in team or car". Formula1.com. 4 July 2007. Archived from the original on 7 July 2007. Retrieved 4 July 2007. ^ "Red Bull to race 30,000 faces at Silverstone". Formula1.com. 3 July 2007. Archived from the original on 5 July 2007. Retrieved 4 July 2007. ^ "Red Bull to race 25,000 faces for Wings for Life charity". Formula1.com. 30 April 2012. Archived from the original on 12 January 2014. Retrieved 25 December 2015. ^ "Silverstone day one - Ralf sets the pace". Formula1.com. 20 June 2007. Archived from the original on 10 February 2012. Retrieved 27 December 2015. ^ "Silverstone day two - Trulli keeps Toyota on top". Formula1.com. 21 June 2007. Archived from the original on 29 June 2007. Retrieved 4 July 2007. ^ "Massa tops final day at Silverstone". Formula1.com. 22 June 2007. Archived from the original on 26 June 2007. Retrieved 4 July 2007. ^ a b "Friday Practice 1 Result". Formula1.com. 6 July 2007. Archived from the original on 8 July 2007. Retrieved 6 July 2007. ^ "Practice 1 - Hamilton makes the perfect start". Formula1.com. 6 July 2007. Archived from the original on 8 July 2007. Retrieved 6 July 2007. ^ "Back injury puts Button out of second practice". Formula1.com. 6 July 2007. Archived from the original on 8 July 2007. Retrieved 6 July 2007. ^ a b "Friday Practice 2 Result". Formula1.com. 6 July 2007. Archived from the original on 8 July 2007. Retrieved 6 July 2007. ^ a b "Friday practice - selected driver quotes". Formula1.com. 6 July 2007. Archived from the original on 8 July 2007. Retrieved 6 July 2007. ^ "Practice 2 - Raikkonen and Ferrari on top, as Toyota surprise". Formula1.com. 6 July 2007. Archived from the original on 8 July 2007. Retrieved 6 July 2007. ^ a b "2007 FORMULA 1™ Santander British Grand Prix - Saturday Practice Result". Formula1.com. 7 July 2007. Archived from the original on 28 December 2014. Retrieved 27 December 2015. ^ "Raikkonen edges Alonso ahead of qualifying". Formula1.com. 7 July 2007. Archived from the original on 12 July 2007. Retrieved 7 July 2007. ^ a b "Hamilton snatches last-minute pole at Silverstone". Formula1.com. 7 July 2007. Archived from the original on 12 January 2014. Retrieved 27 December 2015. ^ a b c "Qualifying Result". Formula1.com. 7 July 2007. Archived from the original on 12 July 2007. Retrieved 7 July 2007. ^ a b c "British race analysis - Ferrari resurgence gathers pace". Formula 1. 9 July 2007. Archived from the original on 12 July 2007. Retrieved 9 July 2007. ^ "Raikkonen and Ferrari unstoppable at Silverstone". Formula 1. 8 July 2007. Archived from the original on 12 July 2007. Retrieved 8 July 2007. ^ "Alonso confident of closing gap to Hamilton". GPUpdate.net. 9 July 2007. Retrieved 28 January 2011. ^ a b "British Grand Prix 2007 statistics & facts". F1Fanatic.co.uk. 9 July 2007. Archived from the original on 1 September 2007. Retrieved 15 August 2007. ^ "2007 FORMULA 1™ Santander British Grand Prix - Qualifying". Formula1.com. Formula One Group. 7 July 2007. Archived from the original on 28 December 2014. Retrieved 27 December 2015. ^ "Raikkonen and Ferrari unstoppable at Silverstone". Formula1.com. Formula One Group. 7 July 2007. Archived from the original on 28 December 2014. Retrieved 27 December 2015. ^ "British Grand Prix - selected driver quotes". Formula1.com. Formula One Group. 8 July 2007. Archived from the original on 28 December 2014. Retrieved 27 December 2015. 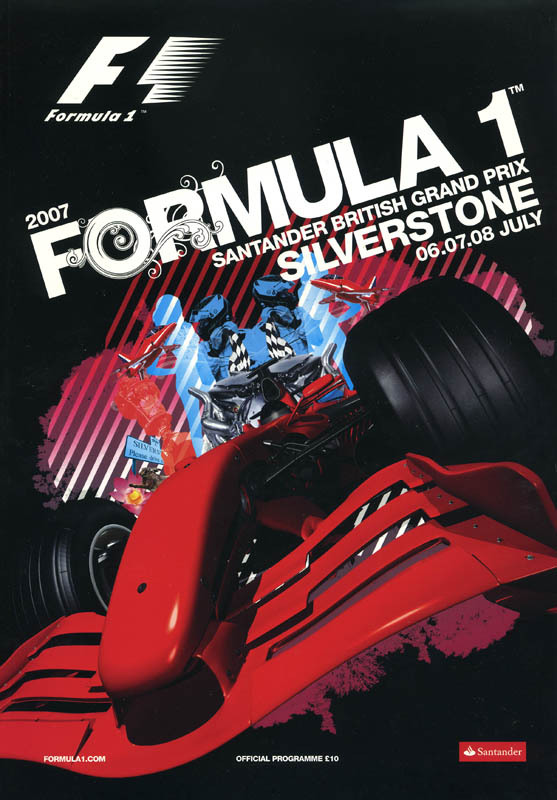 ^ "2007 FORMULA 1™ Santander British Grand Prix - Race". Formula1.com. Formula One Group. Archived from the original on 28 December 2014. Retrieved 27 December 2015. ^ a b "Britain 2007 - Championship • STATS F1". www.statsf1.com. Retrieved 14 March 2019. 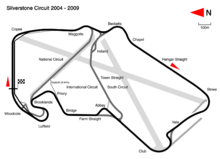 Wikimedia Commons has media related to 2007 British Grand Prix. This page was last edited on 14 March 2019, at 15:11 (UTC).